The most important thing about our delivery schedule is that we only use a dedicated courier - Interlink Express. All our parcels are delivered between Monday to Friday between 9AM - 5PM. On the morning of delivery you will be emailed and sent a text informing you of your 1 hour delivery slot. If you are not available to receive the parcel, you will be able to change the 1 hour slot directly from the mail or text. To assist with this delivery process and to take advantage of the Mobile Text Alerts, Please supply us with a Mobile Phone Number at checkout. 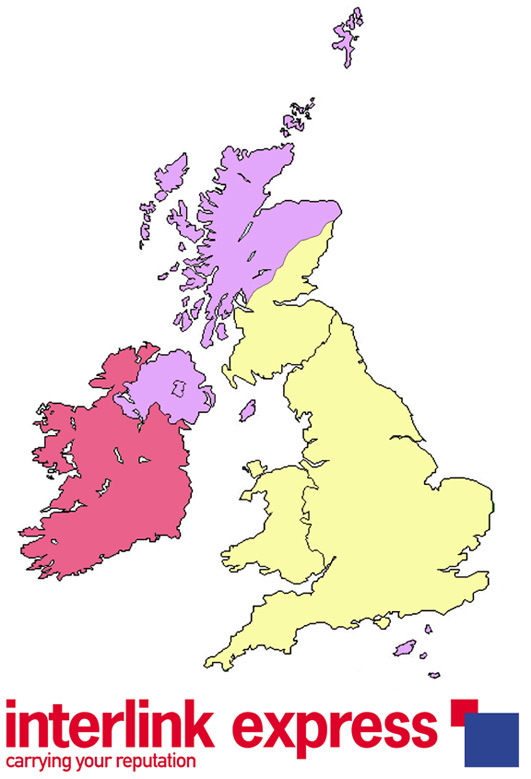 Our Delivery Service is a one time fee of just £2.99 to UK Mainland Areas ONLY - YELLOW ZONE. Please see our table below for more specific breakdowns. Delivery is FREE if you spend over £50. 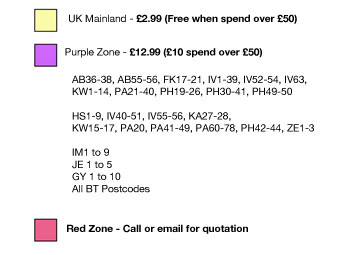 If you are in the Purple Zone you will be asked to pay the Extra £10 that it costs us to send to these postcodes. If this is not acceptable, we will issue a no quibbles full refund. If you are in the Zone marked as Red, or require a parcel delivering outside UK, email or call us for a bespoke price. Please note that there is a one time delivery charge of £2.99 to all Yellow Zones. Free if you spend over £50 with us. Purple Zone delivery is £12.99 or £10 if you spend over £50 with us. Red Zones need to call or email for a specific price. We do not post our canvas prints outside of the UK.